In November 2017, I was inducted into Canada’s Sports Hall of Fame. It was a tremendous honour, and it motivated me to reminisce about my career in speed skating — especially the early days. Looking back now, I’m astonished I ended up in the sport at all. I remember from a young age my parents giving me words of wisdom, grounded in our faith, which came from a verse in the Bible: Whatever you do, work at it with all your heart — Colossians 3:23. I was happy to apply that to my life, especially in my favourite sport, hockey. In fact, I remember the first time my parents suggested speed skating to me. I was about eight years old, focused on playing hockey, and dreaming of being great like my hockey heroes, Mario Lemieux and Steve Yzerman. “We can just sign you up for one race.” That is what they told me. My parents figured that since I was a strong skater in hockey, speed skating would be a breeze for me. I don’t think they anticipated how much resistance I would put up. It wasn’t lost on me that speed skaters wore spandex suits and used extra-long blades that looked old fashioned to my eyes. My fear was so real that I decided I wouldn’t bring it up, hoping they’d forget about speed skating. Turns out, at least temporarily, my parents had given up on the idea, and it was years before they broached the topic again. Fast forward 10 years. My dreams of being in the NHL had long switched to dreams of making the women’s Olympic hockey team. I found out, however, that I wasn’t good enough for 1998 Games in Nagano, and I would have to wait to try out for the 2002 team. It was my first year of university, high school sports had ended for me, and all I had was hockey. I needed something else to keep me busy. Once again, my parents, hesitantly this time, suggested speed skating. They even said they had a connection at the local club to set me up. Begrudgingly, I agreed to try it, if only to put the idea to rest. I don’t remember how it was all arranged, but I wound up arriving at my first practice at Sargent Park Arena, with a baggy track suit, volleyball knee pads, soccer shin guards, and a hockey helmet. The long track ice wouldn’t be ready for a number of months, so my first step on the ice was on short track skates. I remember thinking to myself “This will be a breeze.” Just like hockey skates but faster, right? Boy, was I in for a surprise! With the blades being so much longer and thinner than my hockey skates, I was the definition of an ankle bender, wobbling around the ice, with five-year-olds flying past me. It was a humbling experience and my parents said I was pretty quiet when I came home. They figured it meant I wouldn’t last very long in the sport. To me though, a gauntlet had been thrown down. It knocked me off my feet (quite literally, on to the ice, many times at the beginning) and quickly realized how difficult this sport was, and I wanted to improve. I had the athletic ability to play different sports, but channelling that ability into excelling at speed skating was the challenge I wanted to find an answer to, and I was prepared to work at it with all my heart. I must have raised a few eyebrows that first season, because not only did I refuse to switch to long track skates when we got on to the outdoor 400-metre oval in December (the soft leather in long track skates had little ankle support compared to the short track skates which felt closer to my hockey boot), but I also refused to put on a tight skin suit. Still, I remember watching the 1998 Olympics on TV and being glued to the speed skating. My NHL heroes were replaced by Susan Auch and Catriona LeMay Doan, and I recorded their races on VHS tapes to watch over and over again. My dream to compete at the Olympics had morphed. Hockey was fading, speed skating was rushing in. Everything moved quickly from there. I was more of a work horse than a technically savvy skater, but I made huge jumps in my times when my coaches finally convinced me to accept the inevitable. By the end of that first season, I finally worked up the courage to slip into a skin suit. I feel blessed to have started my speed skating career in Manitoba. 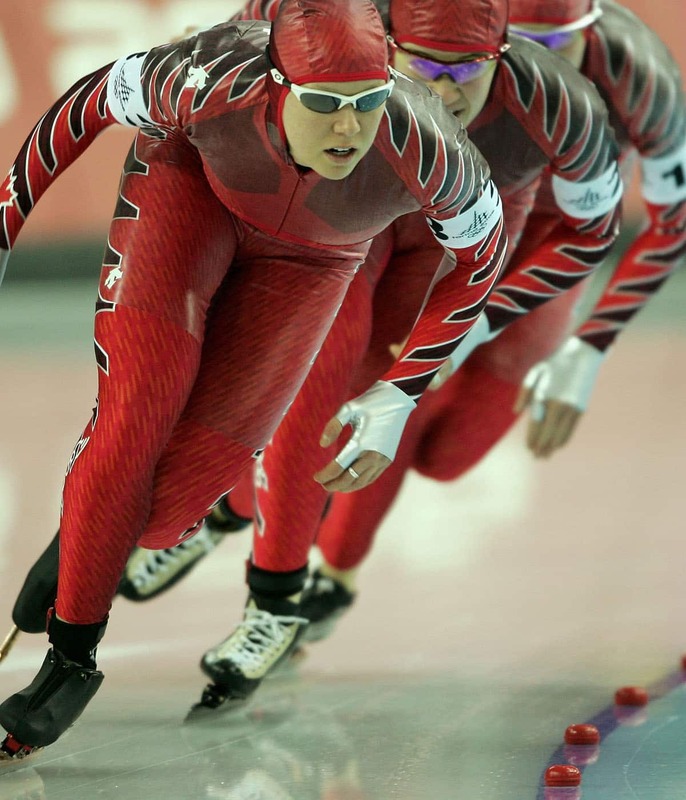 Even though I was one of the older speed skaters and my stride was not as elegant as my teammates, I was embraced as part of the family and really felt the support from the entire speed skating community. I had coaches who believed in me. They suggested giving up hockey for one year to see how far I could make it. I had teammates who pushed me, teammates who I would later be travelling with on the World Cup circuit. I remember going to Calgary for a hockey tournament at the end of that first season and covertly arranging time to buy my first pair of long track speed skates while I was there. Those skates enabled me to officially look like a long track speed skater in my second year of skating. I trained hard the first two years, taking advice from my coaches and also creating my own dry land training programs that carried me through the summer months. I started inline skating to build up my quad muscles, and I watched endless videos of speed skating races, visualizing and trying to mimic in my mind what I wanted my body to do when I stepped onto the ice again in the fall. The dream of one day wearing the Canadian flag on my skin suit inspired me to keep looking forward, even when it seemed I had mountains to climb. In my second year of skating, at 19 years old, I qualified for the junior national long track team, and traveled to Norway to compete in the junior world championships. I remember the nerves and fearfully thinking I would be disqualified for movement at the starting line because my front skate was shaking so much. I raced with all that was within me though, and I walked away from that competition with a gold and a bronze medal. Evidently, my mind was made up, and my course was set. I decided to move to Calgary to continue to work at my new sport with all my heart. That turned out to be a very good decision. Not only did I fulfill my Olympic dream, but I am humbled and amazed how life turned out. I have my name in the Hall of Fame now, alongside those NHL players who inspired me in sport from the beginning. Mostly, my gratefulness extends to my mom and dad for believing in me, pushing me way out of my comfort zone and teaching me that wherever I found myself, whether in sport, or everyday life, to work at it with all my heart.